The Lhasa Apso dog breed originated in Tibet and the name of the breed means “long-hair Tibetian dog”, with Lhasa being the capital city of Tibet and apso being a word of the Tibetan language which means “bearded”. Earlier they were bred only by holy people and nobles and were thought to be holy. They were considered lucky and warned the monks about any intruder entering the monastery. For this reason and because of their smartness, sharp hearing and delicate instincts, they have been used as watchdogs in Buddhist monasteries for over 2000 years. 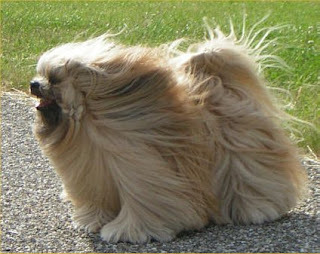 Lhasa Apso is a strong and lively breed who are cautious around strangers. They show dignity as well as comedy and are thought to be one of the most loving breeds and an adorable companion. This breed of dogs is hard to understand, i.e they show double nature. At one side they give a lot of affection and devotion, but on the other they are stubborn and want things done their way. They are energetic and spirited and thus not recommended for families with small children or ill-mannered children. They are an excellent guard dogs because of their strong instincts and sharp hearing abilities. They love to be the only pet so that they can have all the attention to themselves and tend to get bored if left alone for a long time. Because of this, they are not recommended for a two career family. Brushing needs to be done on a daily basis in order to keep the coat tangle free. Moreover, bathing or dry shampooing on a regular basis. Care should be taken regarding the coat because if it becomes long then it needs extraordinary high maintenance. It is a double coated breed and an average shedder. They tend to show an adamant and haughty behavior. Lhasa Apso are tough to housetrain and thus the crate method has to be adopted. It is recommended that they go through early socialization and obedience with strong, fierce and constant training and must be praised or rewarded. They need to be told clearly who the master is because if not trained like wise then they will take charge. Lhasa Apso enjoy playing indoor games and tend to be rowdy, thus covering their daily exercise requirements. Outdoor activities like daily walk and jogging are an added advantage for the breed, Lhasa Apso are apt for apartments and condominiums because they are suited outdoor life. They are generally healthy living for 15 years or more and in certain cases even 18 years. However, they may suffer from ear and eye problems and in order to prevent these regular cleaning and check-ups are recommended. Moreover they may suffer from sebaceous adenitis (skin disease) and the most serious problem found in Lhasa Apso in Kidney disease.